California has many laws discouraging auto dealer fraud, but this doesn’t stop unscrupulous car dealers from attempting to scam vulnerable car buyers. In some cases, car dealers will sell salvage vehicles without disclosing the fact that the car has sustained major damage in a crash or other accident. Learn more about California’s laws on salvage vehicles below, and contact a California auto dealer fraud lawyer if you believe you’ve been the victim of fraud when purchasing a car. A car in California will receive a salvage title when it has been damaged or destroyed to the extent that the insurer of the vehicle has concluded that it would be uneconomical to repair it for the owner. In other words, cars will be marked as a total loss or “salvage” when the cost of making necessary repairs after an accident would be equal or nearly equal to the total value of the vehicle. Similarly, cars will be deemed nonrepairable or “junked” vehicles if they’ve been taken apart after a major wreck, or after having been abandoned. After a settlement, if the owner of the car maintains ownership of a vehicle that was declared a total loss, that owner is required by law to apply for a salvage certificate within 10 days of the settlement. This certificate will then become associated with the car’s Vehicle Identification Number (VIN) in the National Motor Vehicle Title Information Service (NMVTIS). In California, these cars will also be marked with a sticker indicating that they have been branded as salvage. It is illegal to sell a car where the titled has been branded as “salvage” without disclosing this fact to the buyer. Yet despite these laws designed to protect consumers from purchasing a potentially-dangerous vehicle, car dealers still manage to pass off salvage or junk cars to buyers. In some cases, the car was never reported as salvage or junked, and that information does not appear on the car’s official NMVTIS title. 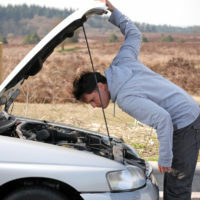 In other cases, a deceptive seller has altered the title or VIN so that the buyer cannot tell that the car is salvage. Regardless of how it happens, the unsuspecting buyer of a car with a salvage title is entitled to rescind the purchase (i.e., get their money back), and may have a right to additional money damages through a lawsuit. National Highway Traffic Safety Administration labels under the hood or on the side of the vehicle’s door – labels that would have been marked with a sticker indicating that the car was marked as salvage—have been removed. If you’ve been the victim of auto dealer fraud in California, get a free consultation on your claim by contacting the seasoned and knowledgeable California auto fraud and lemon law lawyer Nick Nita at 213-232-5055 or 877-921-5256.